I'm excited to share with you two projects I created using the new Paperboy plate being released at Artistic Outpost today! I'm in love with the "newsie" images in this set! They are perfect to collage together, use singly or combine with other AO sets you might have! Don't you just love the sweet newspaper boy! I stamped him in Black Archival on pattern paper, masked him with Eclipse Tape then stamped the buildings in the background. All images are colored with STAEDTLER Karat Aquarell Watercolor Pencils, blended with Gamsol. The sentiment is also from this set, stamped on pattern paper in Black Ink, sponged with Gathered Twigs Distress Ink. I cut the words and layered them onto a Black panel, then adhered to the base card. My next card is perfect for sending to your girlfriends! This coming weekend has been our Girls Weekend for the past two years, unfortunately this year, the dates just didn't work our for us to get together, so my "girlfriends" this one is for you! The girl trio is stamped in Black Archival on pattern paper, all edges are sponged with Ranger Gathered Twigs Distress Ink. To embellish, I added some Zva Creative Jet Black Crystals, a Mini Vanilla Rose and Seam Binding that was tied into a double bow. 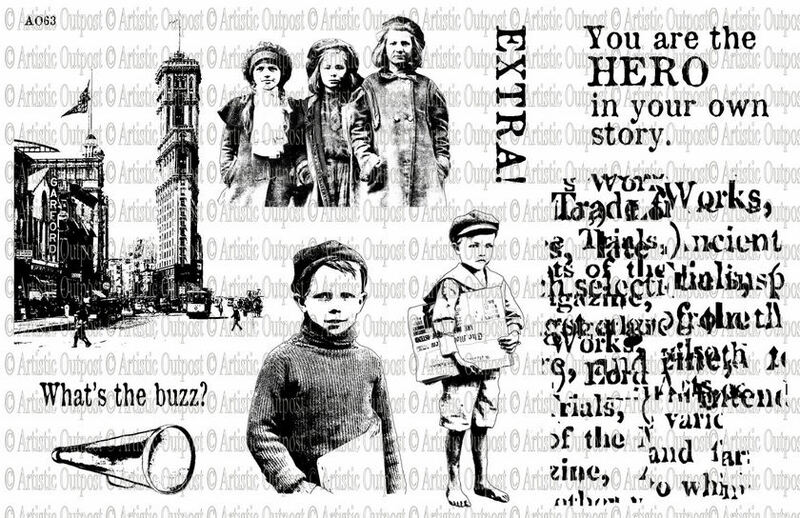 The Paperboy collection features iconic newsboys and girls from the early 1900's when children hocked the latest news on the street corners of America's busiest cities. The collection is available in the Artistic Outpost Store in both unmounted sheets of red rubber for $14 or mounted on EZ Mount cling foam and pre-cut for you for $22.99. The Mounted version comes with a cling card for easy storage. Oh fantastic... what a great idea to combine with the Printery papers! I love your matted card with the girls, and the paperboy is so adorable! Lovely lovely cards. The papers are the perfect backdrop for the sweet images! Love the pop of blue with the black on the girls card. Lovely! The teal bow and black pearls really make that card have a bit of vintage elegance. And I love the neutral background on that first card. Really makes those stamps pop! I do love the newspaper boy and you have colored him and the building so beautifully! Love the offset words! The girls are so pretty with that lovely bow! Beautiful cards! Enjoy! Don't ya' just love them! Beautiful cards, see we'll all have some new fav's. Both cards are gorgeous. That 2nd one just popped right out at me, I love that color combination so much! Sensational samples, Lisa! I really love how you have used the Printery Colleciton and the way you colord the images in the first one and the second just oozes shabby elegance - the teal accents are just gorgeous! Wonderful work with a wonderful plate! Your cards are both fabulous! Another great set by AO- what fun cards with this set! Love these designs on the printed papers....a perfect pairing!